You can visit a local jeweller, but ask them to show you the size of your engagement ring on their ring sizer so there are no mistakes. Or we would be happy to send you a free ring sizer. Just click here to request one. Our ladies rings come in sizes from G to R ½. Our men’s rings come in sizes from P to Z +6. We can make rings in other sizes on request. What precious metal am I looking for? All our rings, including our Plain Wedding Rings can be made in eight different metals: 9ct Yellow Gold, 9ct Rose Gold and 9ct White Gold, 18ct Yellow Gold, 18ct Rose Gold and 18ct White Gold, Palladium and Platinum. What shape, weight and finish should I go for? We offer our rings in four different profiles: Court Shape, Soft Court, Flat Court and D Shape. Our rings come in three different weights: Light Weight, Medium Weight and Heavy Weight. Nine finishes can be added to our rings: Shiny, Matt, Satin, Hammered Matt, Hammered Shiny, Bevelled Edge Shiny, Bevelled Edge Shiny with Matt Centre, Bark Pattern, Milgrain Edge Pattern. What kind of diamonds are in the rings? All our Ladies Diamond Set Wedding Rings and Gents Diamond Set Wedding Rings are set with a minimum of H colour and VS and SI purity diamonds. If you would like a GIA or any certified stone in your ring we are happy to source one for you. If you are interested in us creating your own design, please see Bespoke Rings. If I want a diamond set wedding ring, what different settings are there? Our rings come in six settings: Channel, Pavé, Rub-Over, Tension, Claw and Undercut. Our Narrow Width Ladies Diamond Set Wedding Rings have pavé set and undercut set diamonds. If I have a fancy shaped centre diamond on my engagement ring can I have a matching wedding ring? The Antwerp Diamond Collection is new and very simple and stylish. It consists of seven diamond bands with pear cut, marquise cut, asscher cut, princess cut and emerald cut diamonds, baguettes and tapered baguettes. What can I do if I want my wedding ring to fit next to my engagement ring? We have Shaped Wedding Rings and Diamond Shaped Wedding Rings that are designed to fit perfectly next to engagement rings. Or we can make you one of our Bespoke Rings. What type of engraving can I have in my ring? 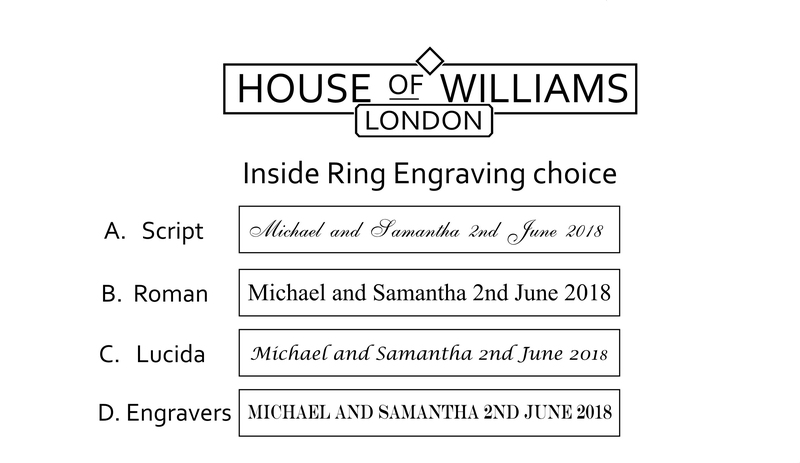 You can choose from four fonts: Script, Roman, Lucida and Engravers Font on the inside or outside of your ring. We hand engrave or laser engrave depending on the precious metal you have chosen and what you're having engraved. We also offer Fingerprint Wedding Rings for that unique touch. See also our Personalised Wedding Rings. Our Art Deco inspired Hand Engraved Wedding Rings are delicate and very pretty. The mixture of gold, copper and silver gives yellow gold its warmth. Depending on what carat you choose, the colour and hardness of the ring will differ. 18ct gold contains 75% pure gold and 9ct gold is 37.5% pure gold. It is mixed with other alloys to make it harder as a ring of 100% pure gold would be too soft to wear. Yellow gold won’t need any maintenance during its lifetime. White gold is a mixture of gold and other white metals such as palladium and silver. White gold rings are plated with hypoallergenic rhodium to protect the white gold. Although strong, rhodium wears away over time. Re-plating can be done to restore whiteness at any time. You can request your white gold ring not to be plated - just add a note when placing your order. 18ct gold contains 75% pure gold and 9ct gold is 37.5% pure gold. It is mixed with other alloys to make it harder as a ring of 100% pure gold would be too soft to wear. Also known as pink or red gold. The mixture of gold, copper and silver gives the rose gold its warmth. Depending on what carat you choose, the colour and hardness of the ring will differ. 18ct gold contains 75% pure gold and 9ct gold is 37.5% pure gold. It is mixed with other alloys to make it harder as a ring of 100% pure gold would be too soft to wear. Rose gold won’t need any maintenance during its lifetime. Palladium is a white precious metal. It doesn’t tarnish or require re-plating. It was for many years half the price of platinum but in the last twelve months has overtaken platinum in price, so now people who may have considered palladium are now considering platinum instead. Platinum is our most popular choice for wedding and engagement rings due to its hardness, rarity and natural white sheen that won’t fade or change colour. Our platinum rings are 95% pure, which means they are heavy, strong, naturally hypoallergenic and will never need re-plating. Court Shape wedding rings are curved on the outside and on the inside. They are very comfortable to wear. Soft Court is like a court shape. Exactly the same on the inside but a less prominent profile on the outside. Flat Court has a flat profile on the outside but is curved inside for a comfortable fit. D-Shape is flat on the inside and curved on the outside. Light Weight Our light weight court wedding rings are very comfortable when fingers are closed. Lightweight rings are only suitable for women, if the engagement ring is light weight as depth differences should usually be avoided. Medium Weight A medium weight court profile wedding ring is the most popular choice. Medium profile rings offer a nice balance of weight without being too light or too heavy, and slimmer widths are popular for matching to standard engagement rings. Heavy Weight Heavy weight wedding rings are ideal for large fingers in greater widths. Heavy weight rings are popular where diamonds are added, because they offer a setting depth that will suit smaller diamond sizes. Where multiple diamonds are set into a channel or groove. A beaded setting often giving the impression of more diamonds. A rub-over or bezel setting holds the diamond in place with a rim of precious metal arcing round the stone. This offers maximum protection to the gems and also add to its perceived size. Uses the metal's natural tendency to spring back to its original position to hold the stone in place. The diamond appears as if it’s floating. Either four or six claws hold the diamond in place. This allows daylight to go through the side of the diamond on both sides, therefore keeping the diamond looking nice and bright.